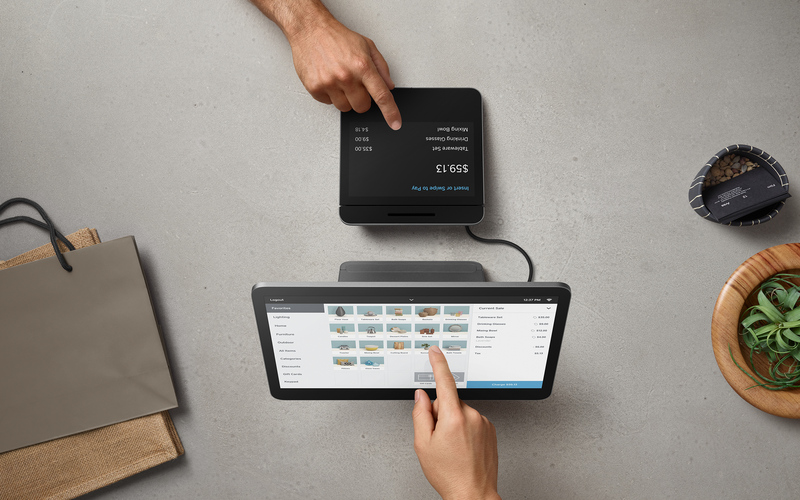 More than two million businesses rely on Square’s Point of Sale to support their business. These two million businesses serve millions of customers across five countries. This increasingly diverse set of businesses and customers has pushed the capabilities of our existing checkout flows to the limit. 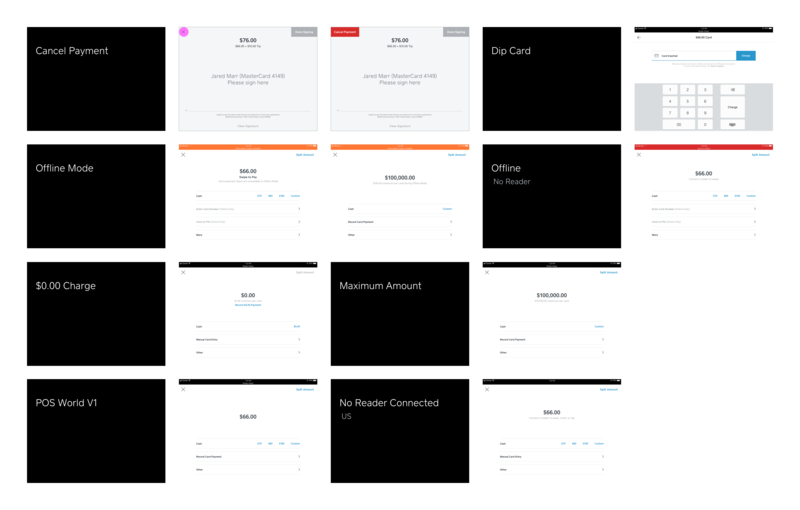 In 2017, we began working on a redesign of the Point of Sale in order to support the next phase of Square’s growth and the millions of new businesses that will begin using our products in the coming years. A visually cluttered payment options screen and the inability to disable or rearrange payment types make the checkout experience slow and frustrating for customers to use. ​​An unintuitive split ticket/tender flow can lead to accidentally recording incorrect payments and causing confusion for merchants. ​​Square’s Point of Sale supports 15 payment types in five international markets. The product runs on two operating systems, four, devices, and three card readers, all requiring performance and reliability on various network connections and old hardware. ​​The goal of our redesign was to reduce inbound support volume for accidental tender types and to increase the speed of transactions. Additionally, we wanted to provide a more fluid payment experience for sellers who only accept certain tender types. We also expected our changes to reduce the onboarding cost for sellers who train their employees on how to operate Square Point of Sale. Part of my work was to add payment types setting into the POS. 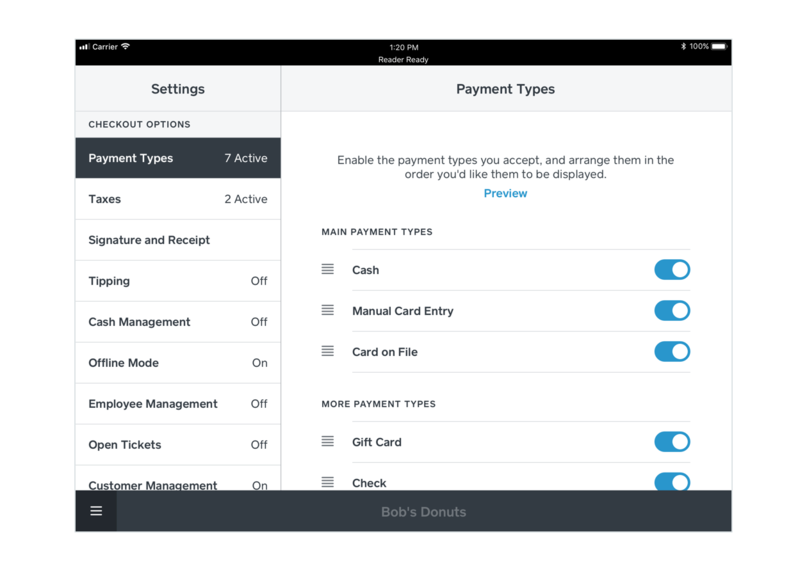 These settings allow Square merchants to easily change the payment types they accept and rearrange them based on their needs. 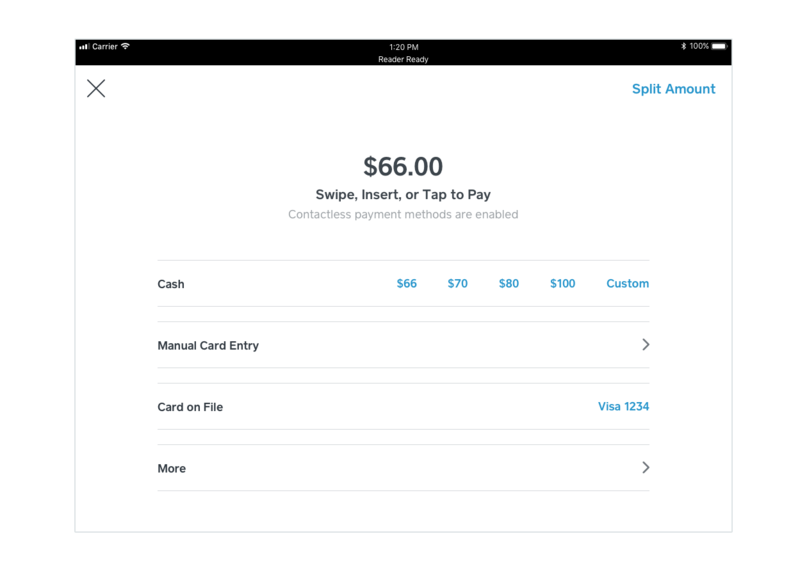 A key component of the redesign was to simplify the checkout screen in order to expose the primary payment types merchants could accept, and bucket secondary payment types in a separate tab. Our work also made it easier for merchants to connect existing customers to new checkouts, making day to day purchases more personal and providing deeper insights to the business. We build each following steps as separate modules. So we can easily rearrange the order to fit each card type in different international markets. For example, in the United States, all credit card companies accept double authorization. This allows Square to authorize the total sale amount first, followed by a second authorization for any tips. In places like Canada, however, some card companies require customers to add a tip first in order to have a single authorization for a total sale amount. Each country where Square operates also has a different tipping culture and different standard for receipt delivery. In US, for example, the tipping option is on by default, but in Japan where tipping is not part of the culture, we are able to disable it by default. This level of flexibility allows us to quickly adjust flows to meet the local demands of our new markets. 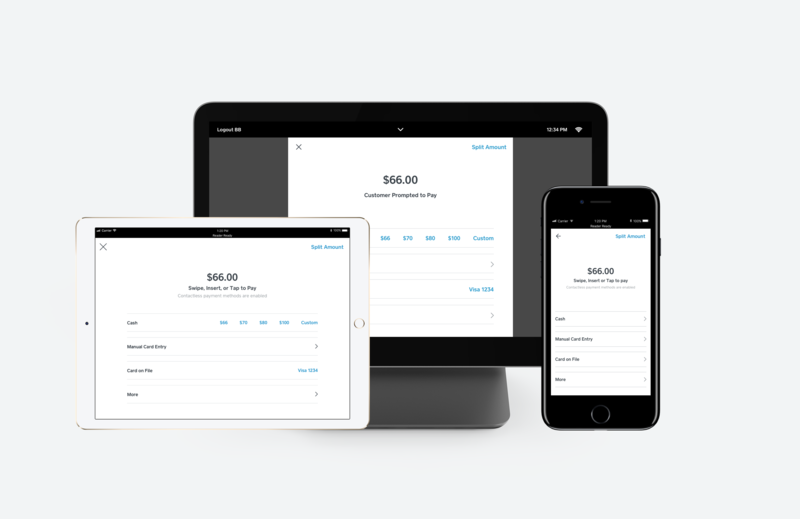 For Square sellers, they have the flexibility on if they want to collect signature and tips base on their business type and ticket size. One of the most important things that had to keep in mind during the redesign was that customers should only ever need to focus on one thing at a time. This meant finding the right balance of functionality and simplicity that could support any type of business, but not be bogged down with confusing interfaces or settings. These are some edge cases while redesign checkout flow.